The oldest reaction mechanism: updated! Reactions in supramolecular cavities – trapping a cyclobutadiene: ! or ? Cavities promote reactions, and they can also trap the products of reactions. Such (supramolecular) chemistry is used to provide models for how enzymes work, but it also allows un-natural reactions to be undertaken. A famous example is the preparation of P4 (see blog post here), an otherwise highly reactive species which, when trapped in the cavity is now sufficiently protected from the ravages of oxygen for its X-ray structure to be determined. A colleague recently alerted me to a just-published article by Legrand, van der Lee and Barboiu (DOI: 10.1126/science.1188002) who report the use of cavities to trap and stabilize the notoriously (self)reactive 1,3-dimethylcyclobutadiene (3/4 in the scheme below). Again sequestration by the host allowed an x-ray determination of the captured species! 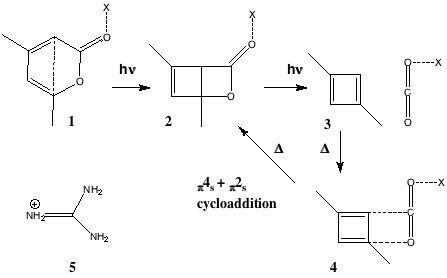 Scheme for production of 1,3-dimethylcyclobutadiene 3 and CO2. The colleague tells me he has himself already penned an article on the topic and submitted this to a conventional journal. However, their rules decree that whilst it is being refereed, I could not discuss the article here, or indeed even name its author. Assuming his article is published, I will indeed reveal his identity, so that he gets the credit he deserves! Meanwhile, I will concentrate in this blog purely on two other aspects of this reaction which caught my own eye after he brought the article to my attention. The reaction involves imobilising a precursor 1 in a crystalline calixarene network as shown above, and then in situ photolysis to form the Dewar lactone 2. Further photolysis then results in extrusion of carbon dioxide and the formation of 1,3-dimethyl cyclobutadiene 3 and CO2, both still trapped in the host crystals. Thus imobilised, here they both apparently remain (at 175K) for long enough for their X-ray structure to be determined. What attracted me to this chemistry was the potential of this reaction as a nice example of a Diels Alder reaction occuring in a cavity. The first example of such catalysis was reported by Endo, Koike, Sawaki, Hayashida, Masuda, and Aoyama (DOI: 10.1021/ja964198s) and I have used this in my lectures for many years. This latter example however illustrates the promotion of a cycloaddition, which inside a cavity is accelerated by a factor of ~105, rather than of the reverse cycloelimination. I explain this to students by invoking entropy. Normally, when two molecules react together, there is an entropic penalty, which can add 8 or more kcal/mol to the free energy of activation of a bimolecular reaction in the absence of the cavity. By a strange coincidence, my name is also on a recently published article (DOI: 10.1021/ol9024259) with other colleagues on the use of (Lewis) acid catalysts to accelerate a type of reaction known as the Prins. This involves the addition of an alkene to a carbonyl group. Now as it happens, the reaction in the scheme above showing 4 → 2 happens to combine these features; it is both a Diels-Alder cycloaddition and also involves an alkene adding to a carbonyl compound! It is therefore noteworthy that the claimed reaction 1 → 2 → 3 + CO2 is done in the presence of a strong acid catalyst, the guanidinium cation 5, which is itself part of the structure of the calixarene-based host. It is represented as X in the scheme above, and can also be identified in the above 3D model via the light blue atoms. There are however crucial differences between these two earlier examples I quoted and the reaction of 2 → 3; the latter is in fact a cycloelimination and not a (cyclo)addition. In other words, according to literature precedent, the guanidinium cation-based cavity should act to accelerate the reverse cycloaddition 4 → 2 rather than the forward cycloelimination. Since the isomerisation 3 → 4 is thought to be fast, the question arises: how rapid is the reverse reaction 4 → 2? In particular, is it slow enough to allow X-ray diffraction data to be collected for 3/4 over the necessary period of 24 hours or more? Legrand, van der Lee and Barboiu do not address this point in their article. Nor is there discussion there of how the cavity and the acid catalyst might influence the position of the equilbrium 2 → 3 + CO2. This is where calculations can help. At the B3LYP/6-311G(d,p) level four different models were selected. Model A is a simple gas phase calculation for the singlet state, which reveals the free energy barrier for 4 → 2 is already quite modest for a Diels-Alder reaction (more typical values are ~22 kcal/mol), due no doubt to the instability/reactivity of the cyclobutadiene. However, at 175K, that would still be quite sufficient to prevent the reverse reaction from occurring to any extent over the period of X-ray data collection. Model B adds a condensed phase (water) to the model. This serves in part to simulate the condensed crystal environment (which is pretty ionic being a tetra ion-pair). The barrier drops to 12.1 kcal/mol. 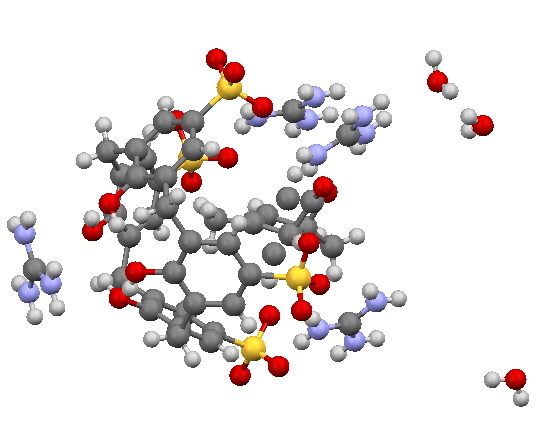 Adding one guanidinium cation to both these models (C and D) which simulate the Prins conditions, drops the barrier to 8.3 kcal/mol (model 4). You can inspect details of any of the calculations by clicking on the digital repository entry (shown as dr in the table), where full data is available. None of these models includes the entropic effects of full constraint in a cavity (which I estimated above as capable of reducing the free energy barrier for reaction by ~8 or more kcal/mol). If this correction is applied to model D, it would reduce the barrier to ~0 kcal/mol! The calculations also reveal that the reverse reaction 4 → 2 is exothermic, and this exothermicity is enhanced by the acid catalyst 5. It would be further enhanced by reducing the entropy of reaction by pre-organizing the reactants in the cavity. The tendency must therefore be for 3/4 to revert to 2 on purely thermodyamic grounds, and only the presence of a significant kinetic barrier would allow them to exist as separate species. This barrier, as one might infer from the calculations shown in the table below, may not be a large one. Even a barrier of 8 kcal/mol might require cooling to significantly lower than 175K to render the reaction slow on a ~24 hour timescale. So I end my own speculations here on the nature of the reaction reported by Legrand, van der Lee and Barboiu by asking: are the products they claim (1,3-dimethylcyclobutadiene and carbon dioxide) capable of existing as separate species for long enough inside their cavity, even at 175K, to allow for the collection of X-ray data for a structure determination? I tend to think probably not (? rather than !). But do decide for yourselves. Archived as http://www.webcitation.org/5rpkn2Z5S on 08/08/2010. See also this post. This entry was posted on Sunday, August 8th, 2010 at 8:59 am and is filed under Interesting chemistry. You can follow any responses to this entry through the RSS 2.0 feed. You can leave a response, or trackback from your own site. The two Me2CBD species reported in the Science paper cannot be on the same singlet potential energy surface, where the square form can only be an energetically high-lying transition state. Triplet Me2CBD has a square minimum, but it’s energy is even higher that the singlet TS. Perhaps the triplet is formed by irradiation, and its decay forbidden. Although the computed ring CC bond lengths for the triplet square and the singlet rectangle agree approximately, I am skeptical about many other details. Of the various interesting points raised in the comment by Paul Schleyer, I confine myself to one; the possibility that the triplet CBD is formed by irradiation and its decay to the singlet is forbidden. The CBD is trapped in a cavity formed by, inter alia, four pairs of [SO3–.Guanidinium+] ion pairs forming what might be an intriguing octupole-like arrangement. It also finds itself in a distinctly asymmetric environment. One cannot but wonder whether a symmetry-forbidden triplet-singlet transition would necessarily be slow under such conditions. In my post on this topic, I noted that the reaction between 1,3-dimethylcyclobutadiene and carbon dioxide in the presence of an acid catalyst is predicted by DFT theory as being exothermic, and that these two species could only co-exist if the free energy barrier for this reaction is sufficiently high. But how high? Putting in T = 175K, and the requirement that the half life be at least 24 hours to allow X-ray data collection, one can approximate Ln (k/T) ~ -16.9, which from the above equation renders ΔG ~ 14.1 kcal/mol. Since the various ΔG‡ noted in the post for model reactions are notably less than this, and the entropic effect imposed by the cavity is unlikely to substantially increase the free energy barrier (via what would have to be unusual entropic contributions), it seems a reasonable inference from the calculations that data could not be collected on 1,3-dimethylcyclobutadiene and carbon dioxide as separate species inside a host with acid catalyst components. Reactions in supramolecular cavities – trapping a cyclobutadiene: ! or ? is licensed by Henry Rzepa under a Creative Commons Attribution-Noncommercial-Share Alike 3.0 United States License.